1. Place the drained beans and sweetcorn into a bowl and crush with a potato masher or fork. Mix in the chipotle paste, tomato purée, coriander and cheese. Season and add the lime juice, to taste. 2. Spoon the bean mixture onto one half of each wrap. Fold the wraps, squashing them down to enclose the filling. 3. Heat half of the oil in a large frying pan and fry the wraps, two at a time, for 1 minute, until golden brown and crisp. Carefully flip over and fry on the other side. 4. Peel and mash the avocado with the lime juice and some seasoning. 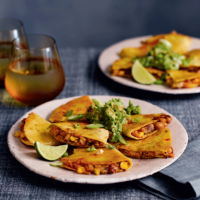 Cut each quesadilla into wedges and arrange on a plate with the mashed avocado. Scatter with the salad onions and serve.